The DeLuca Toyota crew has handed over a lot of keys in their day, and they recently took part in a key exchange of a different sort. Frank DeLuca & DeLuca Toyota has worked in partnership with Habitat for Humanity of Marion County, Inc., sponsoring home construction projects for deserving families who have been carefully selected by the organization. “Since 2007, a total of nine home sponsorships have enriched the lives and reduced the struggle for 12 adults and 28 children. We are building hope. Giving back gives me great contentment and satisfaction to help others in need.” comments Frank DeLuca, owner/president of DeLuca Toyota. Those contributions make Frank DeLuca the largest single annual donor to the Habitat for Humanity of Marion County cause. On February 23, Habitat for Humanity of Marion County held a key presentation ceremony for a recent build. After a special program for the honored recipients, the Gavin family proudly accepted the keys to their new home. The house, both created and earned through blood, sweat, and tears, represented a blessing and a goal achieved for Quanese Gavin. For Gavin, it was a long-awaited moment that was highly anticipated and earned through considerable effort. As per Habitat requirements, Gavin completed sweat equity hours—461 to be exact. This typically involves the partner family assisting in other home builds, becoming familiar with the ins and outs of the Habitat for Humanity organization, and taking classes on the fundamentals and logistics of home ownership. It’s safe to say that in doing so, participants learn aspects of home ownership that allude a great many modern day homeowners. “I wasn’t handy at all,” says Gavin of her time prior to coming to Habitat, adding that she’d known nothing about dry wall, fixtures, and plumbing. But after getting down in the trenches with the other volunteers and dirtying her hands, Gavin learned the tricks of the trades in home improvement. Now she’s confident she’ll know how to repair her new home, rather than paying someone else to do it. 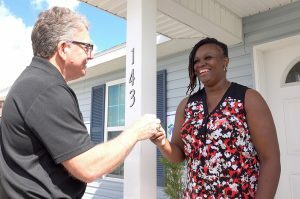 Habitat for Humanity Executive Director Dave Layman says he routinely watches in amazement, the changes that take place when partner families learn these new construction skills. “Our family partners don’t come in as tradesmen. They’re not electricians. They’re not carpenters. They’re not masons. They’re not roofers. They typically don’t have any construction skills at all,” Layman says. Yet that all changes relatively quickly through hands-on practice. The entire eligibility process typically lasts 12 to 18 months. Through endurance, faith, and hard work, these motivated men and women prove their commitment to becoming homeowners. Along with the 350 sweat equity hours, partnership family candidates must go through a current home evaluation, a credit check, and various income and financial assessments to boot. “We’re going to do as best we can to put them in a situation where they’ll be in an affordable house and they won’t fail,” Layman says, explaining the thoroughness and thoughtfulness that goes into choosing recipients. In addition to the volunteers, partner families, and professional construction workers, the labor of love comes together with the help of local sponsors. “We’re just tickled to have DeLuca Toyota as a partner and our affiliate. DeLuca Toyota sponsored well over nine houses through the CCTCP program,” Layman says. The CCTCP, which stands for Community Contribution Tax Credit Program, offers an opportunity for tax paying businesses to sponsor houses and earn a credit on the sales tax for the construction. DeLuca Toyota has been proud to take part of this community effort and join the ranks of other businesses coming together to distribute key after key to local homeowners. Pastor Keith Shaw of Kingdom Impact Ministries led the house blessing before the key presentation portion of the ceremony. Along with the obvious fruits of labor, there is a lot of prayerful intention that goes into these homes. A central part of the process involves volunteers writing Bible passages and prayers inside the walls before they are secured into place. The mission behind the Ocala Habitat effort is to emulate God’s love by offering communities strength, hope, and dignified housing solutions. If you are interested in becoming involved with Habitat as a donor, contributor, or work site volunteer, contact habitatocala.org or call the administrative office at 352-351-4663. DeLuca Toyota knows how empowering a key can be, whether for a car or a home. Join in and play a key role in opening the door and welcoming a partner family. 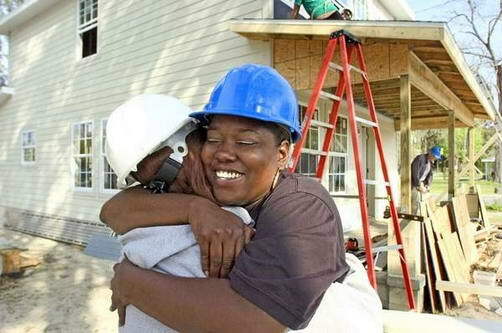 New homeowner Jammie Long, 28, right, hugs Theresa Morsillo, the executive assistant at Habitat for Humanity, as her house is being built by volunteers in Ocala. Habitat for Humanity International has more than 2,100 affiliates in more than 90 countries throughout the world, with 1,500-plus affiliates nationwide. Habitat for Humanity of Marion County (HFHMC) is one of 66 Habitat affiliates in Florida and ranks 22nd in the nation with regard to homes built. From its incorporation in 1990 through 2007, HFHMC has provided a simple, decent place to live for 119 low-income families. Of that total, HFHMC has since 2002 provided 74 homes to Marion County, adding 74 new families, including 201 children, to our county’s tax rolls. Last year alone, 17 homes were completed and blessed, thereby providing homes for 17 families, including 45 children. Included in this count are three independent subdivisions: Blitchton Village, Providence North and Proverbs Landing. Agape Place is under construction, and Phoenix Place and Joshua Ridge are in the planning stages. HFHMC is not a handout, but a hand up. Each family is qualified based on three criteria: need for shelter, ability to pay back a zero-interest mortgage and willingness to partner with Habitat by doing 500 “sweat equity” hours working in our retail stores, attending classes, building on other partners’ homes and, finally, helping to build their own home. Construction takes place in both Ocala and Dunnellon, and as many as six to 10 homes are under construction at any given time. Much of that construction currently takes place at Agape Place, the first and second phases of which feature 10 homes on two adjacent city blocks in the West Ocala Historic District. Other phases will ensue over the course of the next year or two, covering as many as 48 lots within a one-mile radius of the first phase. Within the next couple of months, HFHMC will also begin construction on two more homes in Dunnellon. Our continued support from the city of Ocala and Marion County coupled with such community partners as Taylor, Bean and Whitaker; DeLuca Toyota; Community Bank and Trust; Independence Bank; the Ocala faith community and many anonymous donors has enabled us to continue to grow as we continue to try and meet the affordable housing needs of our community. Habitat’s successes could not be realized without our volunteers, who work side by side on a daily basis with our family partners. Volunteer opportunities include, but are not limited to, construction, assisting at our administrative office, providing customer service at both of our HomeStores (one in Ocala and one in Dunnellon), serving on supporting committees and staffing our Board of Directors. All of these volunteers impact our cause by generously donating their time. Speaking of volunteers, in August 2006, HFHMC launched a Youth United program. Only 75 of our nationwide affiliates currently sponsor such efforts. HFHMC is the second of the Florida affiliates to host this program. Youth United is a completely youth-driven program for youth ages 5 to 25 that harnesses their energy, enthusiasm and determination toward the goal of completing a youth-built house. HFHMC has high hopes for this program, as well as for our Campus Chapter at Trinity Catholic High School. To foster leadership development for these youth, HFHMC has invited youth representatives onto its Board of Directors and Church Relations Committee and has involved youth leaders in state, regional and national Habitat conferences and training programs. We are currently recruiting for a full-time VISTA position to more fully develop our youth program. Last year our affiliate had a total of 4,874 volunteers of all ages from throughout the community, and internationally. They gave 21,493 total hours of service to Marion County through their work with Habitat, the dollar value of which, calculated at $18.04 per hour, comes to $387,729.21. The backbone of our construction volunteers is made up of our “Golden Hammers,” tireless volunteers who work every Tuesday, Thursday and Saturday. Without their expertise, our building efforts would be hard-pressed to meet our building goals. In addition, both HFHMC HomeStores (selling new and gently used donated items for the home) generated a total income of approximately $500,000, thereby allowing 92 percent of all revenue, including donated funds, to go into “sticks and bricks” – the very houses for which our community is in such desperate need. Each calendar year, HFHMC sets its goals a little higher. Our goal for 2008 is to complete 20 houses in Marion County. One of those will be our 2008 Women Build, which started May 10. We have already closed two homes this year, and 11 homes are concurrently under construction in and around the West Ocala Historic District. With God’s help, we plan to complete six or more of those homes by the end of the fiscal year and the remainder by the end of this calendar year. Within the next few months we plan to refurbish another house on Blichton Road, begin construction on two more homes in Dunnellon and continue to add new construction to our Ocala schedule. It takes a lot of people – volunteers, donors, staff, prayer warriors, supporters of all kinds – partnered with our community’s families in need to get the job done. HFHMC gives thanks to God for His many blessings, most especially the opportunities He provides to make a life-sustaining impact in our community. If you would like to become involved with HFHMC please contact our offices at 352-351-4663. Brad Nimmo is president and CEO of Habitat for Humanity of Marion County in Ocala.